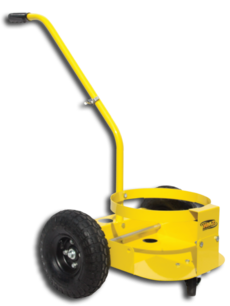 The 5 Gallon Bucket Cart, is an industrial grade handcart designed specifically to handle all of SMK’s cordless sprayers mounted on a 5 gallon bucket. The C100 Bucket Cart is perfectly balanced providing almost effortless mobility loaded or unloaded. With its non-slip handle grip, compressed air tires, powder coated finish and hose hanger, the C100 Bucket Cart takes spraying portability to a whole new level. Place an order by calling 515-202-0052, or send us a message for any product questions you may have.